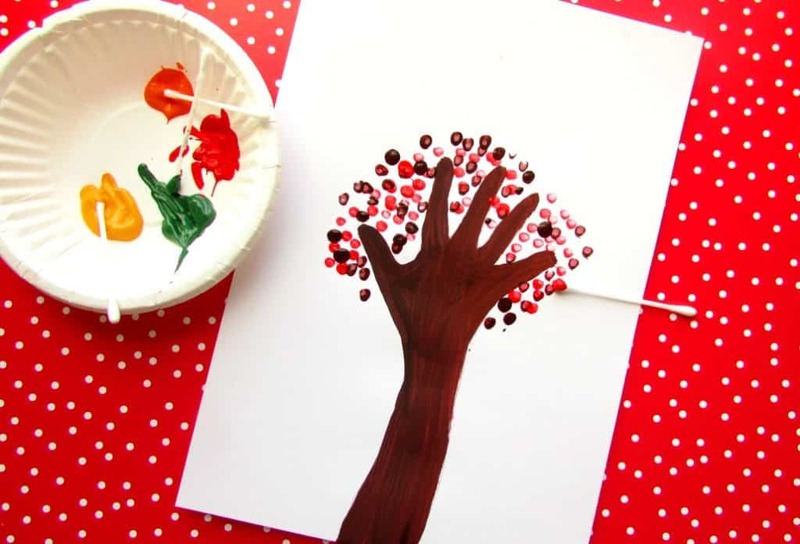 Autumn is a gorgeous, colourful season that never fails to get the creative juices flowing and if you’re looking for an opportunity to explore simple colour-mixing techniques within a seasonal theme, then this Autumn Handprint Tree art project is the one for you. Children can observe the natural change that comes with Autumn and attempt to recreate what they see within their art. Throughout the process, encourage your Arty Crafty Kids to mix their own colours and describe what happens when the colours mix. 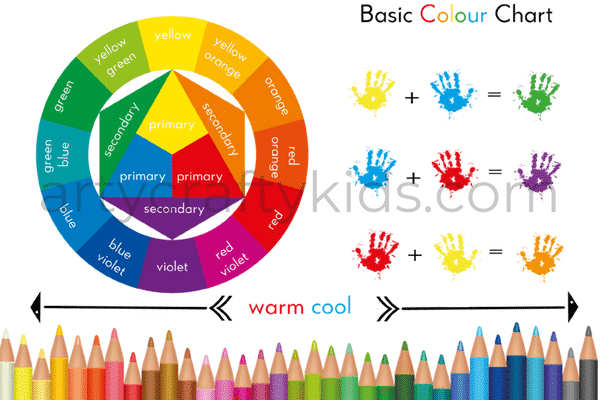 For your reference, here’s a very basic colour chart that you may find helpful! Step 1. Using a pencil, draw a faint line around the hand and arm of your child. If your child is of preschool age or older, they may want to have a go themselves. Next, paint the print brown. 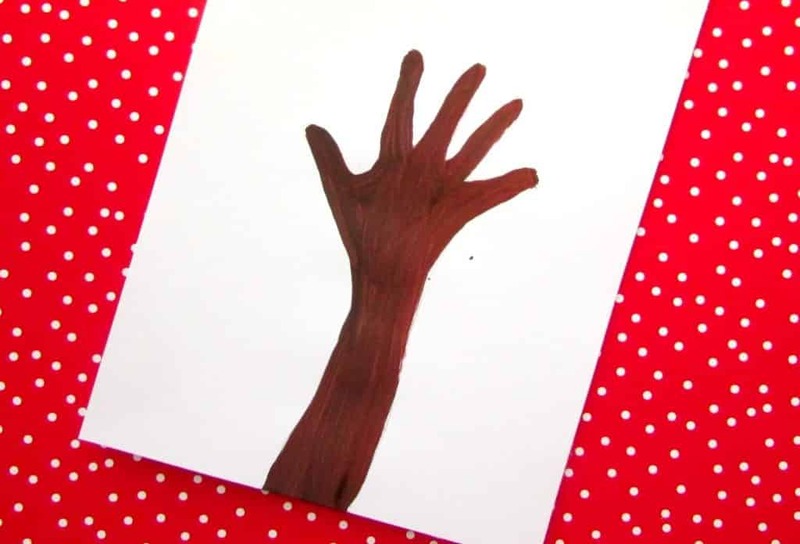 Alternatively, simply draw around the arm directly onto a piece of brown paper and cut out the shape and stick. Step 2. 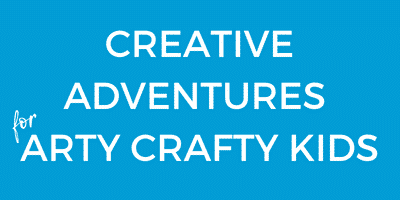 Time for the really fun bit – colour mixing! This is s chance for kiddos to explore colour by experimenting with primary colours to create Autumn shades of red, yellow, orange and green, oh and of course brown (every toddler can make brown!). 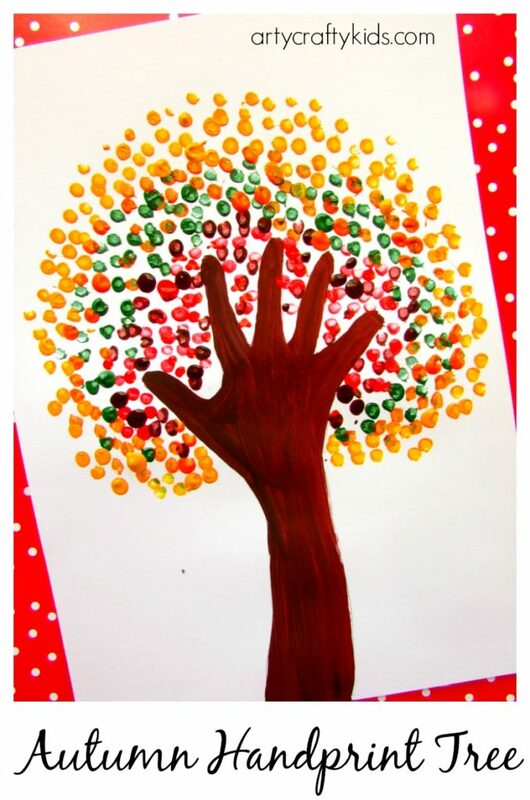 Using a q-tip, end of a pencil or even your child’s finger, begin adding dots around the tree. Step 3. Build the dots with different colours. 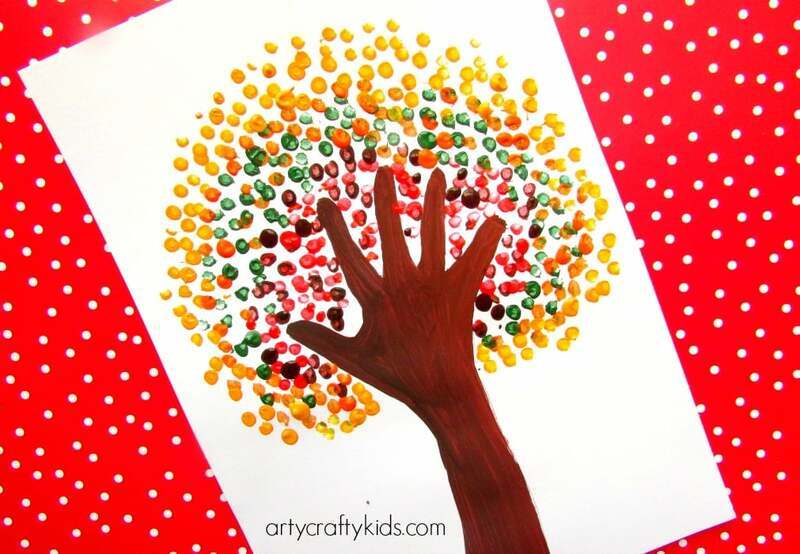 Try overlapping the dots and see the print transform into an Autumn Handprint Tree! 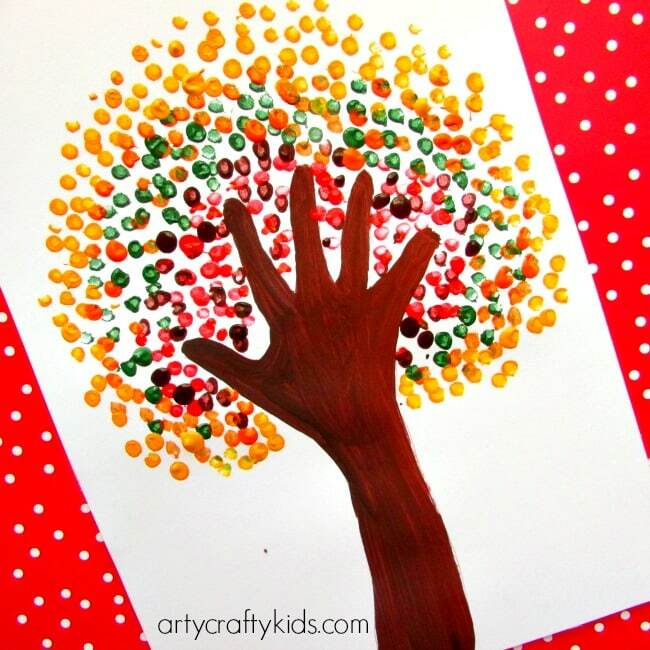 Since writing this post in 2015, I have seen hundreds of Autumn Handprint Trees completed by children from all over the world and it’s established itself as a favourite tree art project with teachers! Thank you for all the amazing feedback. Every photo brings a smile to my face! 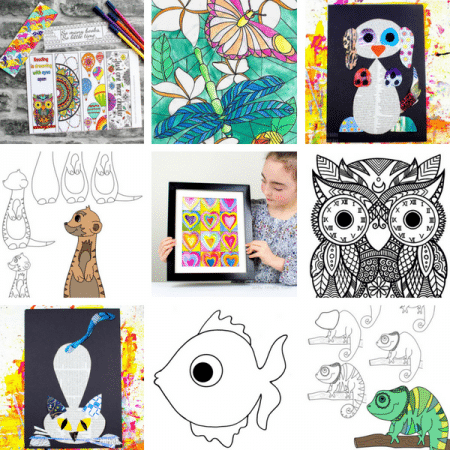 In addition to this, every box includes an Artspiration booklet that’s filled with how-to-draw tutorials and drawing prompts to enhance your Arty Crafty Kids creativity. For more Autumn themed Art and Craft inspiration, you may also enjoy our collection of Woodland Animal Crafts and Creative Fall crafts for Kids, as well as our Splatter, Glitter and Bubble Wrap Autumn tree art ideas.